The other day we had quite the adventure while showing some of our clients around. So we are showing this property out in the county and as we get out of our vehicles 2 turkeys start wandering over. Oh how cute we all say. We get into the house before they reach us. As we wander around the house I notice the turkeys sitting at the sliding glass door. I start watching them with our clients little girl. “Look how friendly they are” I say to her as she was a little nervous of these big funny looking birds. 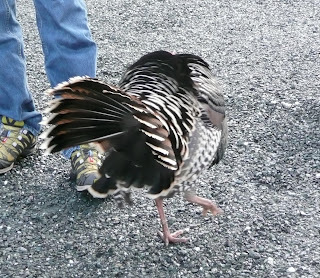 All of a sudden the male turkey starts pecking the window. Hmmm note to self: maybe they are not so friendly. After we finished looking at the interior of the house my clients want to see the outside. Great now we can meet those “cute birds”. So we all bundle up wander outside and are immediately under attack. The only warning is a loud “chortling, peeping, clucking” sound that turkey’s make. Now I grew up with birds and usually you can intimidate them by just putting your hands over your head and walking towards them. 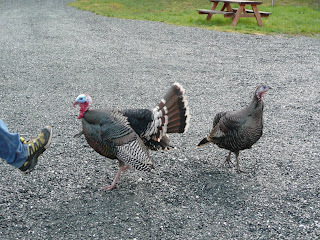 Oh No not these Guard Turkey’s. They would back of a couple inches and wait for you to turn around so they could go for the soft fleshy parts of your body if you know what I mean…So we attempted to look at the property but getting dive bombed by crazy prehistoric raptor cousins makes it a bit challenging so we finally gave it up and ran for the safety of our cars. The funniest thing about this whole adventure is the home owner had two large dogs who just sat in their pen and wagged their tails watching the feathered pecking monsters chase us around. 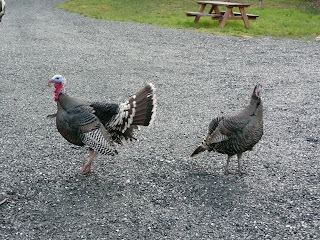 I swear those dogs were laughing at us as we drove away…and I KNOW the turkeys were because I could hear them. Here the cute little birds come wandering over peeping and cooing to lull us in to a false sense of security. False sense of security is ripped away as scary raptor beast bird starts launching into attack while his partner squeeks in high pitched excitement. Full on attack in progress, wings flapping, screaching and that oh so sharp and scary pointed beak.